Summer's not over yet, ya'll! I found the cutest two piece set a few weekends ago, and it's been perfect for what I like to call "weekending." I talk about this a lot, but I always struggle with finding a pair of shorts that are appropriate in length. These, however, are the perfect length! Not too long, not too short. I also really appreciate the high-waist paired with the matching crop top. It fits true to size, and I'm wearing a small in both pieces. My shoes are a dupe for a more expensive designer pair, they're under $30 and relatively comfortable! They took a little breaking in, but after a few wears they're much comfier! If you're looking for additional affordable shorts/top combinations, check this post out as well! I'm off to church with one of my girlfriends this morning! I hate to admit this, but this is the first time I'm attending church in as long as I can remember. I've had a ton of ups and downs this year, and honestly am looking forward to a little inspiration today. I hope you guys are having a great weekend! One more sleep till the weekend! Whose ready!? I know I sure am. I've worn these shorts a few times over the last few weeks and I'm so happy with them! They have a fun scallop hem on them that gives them a feminine/flirty touch. They are also finally long enough! Can I get an amen!? The waist zips at the hip, but the back of the shorts have a stretchy band on them allowing for a little extra room. Not bad for $55! 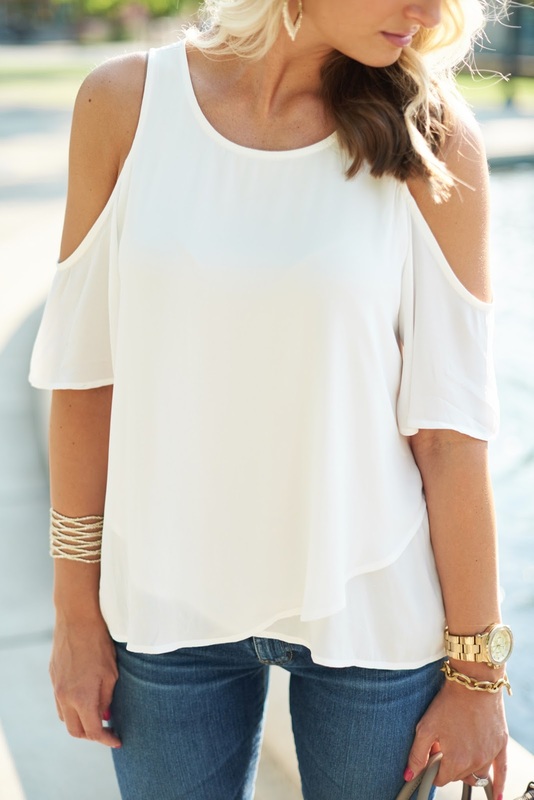 I paired them with this Topshop bodysuit here, however, I wore them again to dinner in Charleston and chose this top for a more "classy" look! Can we also talk about the shoes?! I found these at the Nordstrom Anniversary Sale and bought them in both colors. I personally like this style of shoe anyway, but the studs on them were appealing for an edgier flare. I'm imagining wearing them in the fall with black skinnies and a moto jacket! We had a nice mid-week break in Charleston Wednesday for our wedding tasting. I started the morning with a run through downtown, and I just can't get over all the old architecture, beautiful flowers, and southern charm. It's truly one of the most magical places I've ever been too! I'm so excited about the food we chose! I ate so much you could've probably rolled me back to Charlotte but we were really impressed with the quality! I also crossed off my hair and makeup trial from the list. Again, nothing short of impressive and I can't wait to share the final results with you on our big day! I wish I could share sooner, but I want to keep it a secret for Shane. In case you missed it, this blogpost also features affordable shorts that are longer and great for a night out on the town! That's all I've got for today, hope everyone is having a great week! When you find a top for under $30, you buy it in every color. Am I right? This is the perfect "buy now, wear now" closet staple. I love the cold shoulder, and it's lightweight and thin to keep you cool through summer. 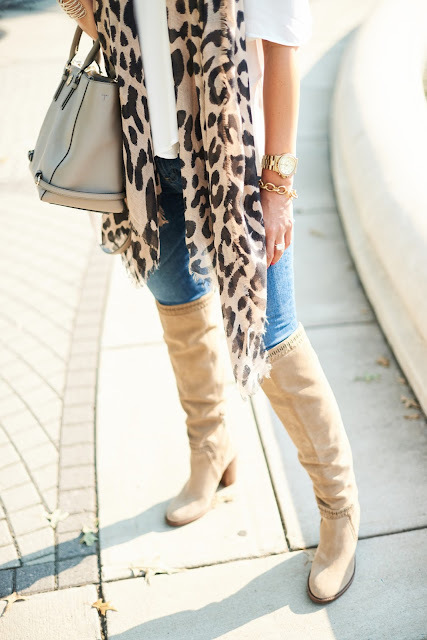 In the fall, it'll be the perfect layering item like I did above with this $11 scarf! You can also pair it with distressed jeans and heels for a cute date night outfit now. I scooped up these over the knee boots at the Nordstrom Anniversary Sale for under $160 (normally $240) and they're still currently in stock in all sizes! Boots and shoes are always a favorite of mine during the Nordstrom sale. The few times I have passed on an opportunity to buy them at steep discounts like these, I've always regretted it in the end. These fit true to size, and are comfortable to walk in! They come in four colors, and also seem to be insulated pretty well (my feet were on fire wearing them this morning in the heat). Shane and I had a wedding in Georgia Saturday evening! We had such a good time celebrating the happy couple, and it made us really excited for our own wedding in just five short months! Can ya'll believe how fast time is going by!? I got a ton of questions via Instagram about the dress I wore to the wedding, so I linked it for you here. It's actually the dress I wore in my engagement photos earlier this year! Today is the first day of the Nordstrom Anniversary Sale public access! This means, card or not, all shoppers can shop the sale. Can I get an amen!! With that being said, many of you have asked me what the most popular selling item in the sale has been for me. So today, I want to chat about this colorblock cardigan! I love this piece for so many reasons. One being that you can style it a million different ways, and two being that it's perfect for what I like to call "pre-fall". Pre-fall is when the weather begins to fluctuate towards cooler temps, like in the mornings and evenings, but it's still hot as you know what during the day. You're probably thinking "Okay Vanessa, there's only so many ways you can style a cardigan" which is true, but, you can easily dress this up for a dinner date or dress it down for Saturday at the mall with your girls. Personally, I can't wait to pair it with these leggings, a black tank and OTK boots. You could also switch out the blue jeans, for a pair of distressed black jeans like these, and a white tank for a different look. There are plenty of options! This was my first time purchasing AG denim, I'm traditionally a Rag & Bone or Paige denim girl but so far, i'm impressed! They have plenty of stretch in them, and I really like the raw hem detail that's trending right now. I would reccommend sizing down one size as they do stretch out a little. As for my pumps, these are perfect if you're not a fan of a high heel but you want something to spice the outfit up a little. They're comfortable to walk in, and look great with black as well! 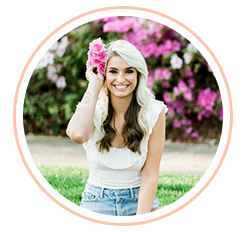 For all of my favorite items from the sale, be sure to check click here and here. We are off to Georgia for a wedding this weekend! Shane and I have both been traveling separately for a large portion of this summer so I'm excited to spend a little QT with him and celebrate another happy couple! This isn't the prettiest blogpost I've ever written, but you guys have had a ton of questions about different pieces from Instagram Stories! So, with public access starting tomorrow I figured it would be easiest to do a full dressing room round up for you! If you don't see your size, check back at midnight tonight or first thing tomorrow morning as things will be restocked, but I don't expect sizes to last long! All items fit true to size here. The store associate did reccommend I size down one size in the AG Jeans. However, they didn't actually have a 26 in stock in the store, and the 27 felt perfect - so I will report back on wether or not they stretched out! All items here fit true to size as well. All items fit true to size. Cardigan: Wearing a size small, but could've used an extra small. Size down! Striped Tee: Wearing a size Medium in the picture, but needed a Small. Size down in the cardigan one size. Everything else fits true to size. Sweater: Wearing a small, runs small. I wanted to love this top because it's so cute on others! But unfortunately, it just runs really short. I'm 5'8" and it barely came to the top of my jeans. Tank: Wearing a size Medium in the photo, ordered a small. This cardigan has been one of the most popular items in the sale! It's soft and looks great with the tank shown, or a simple black, white, or dark green cami! Plaid Tunic: Wearing a small, ordered a Medium. This runs small, size up one size. Everything fits true to size here, size down in the cardigan if you're a smaller person. Good Morning, and Happy Monday! Today I want to chat about this little blue dress from the Nordstrom Anniversary Sale. First of all, how good is that sale?! Ugh, I dieeee. 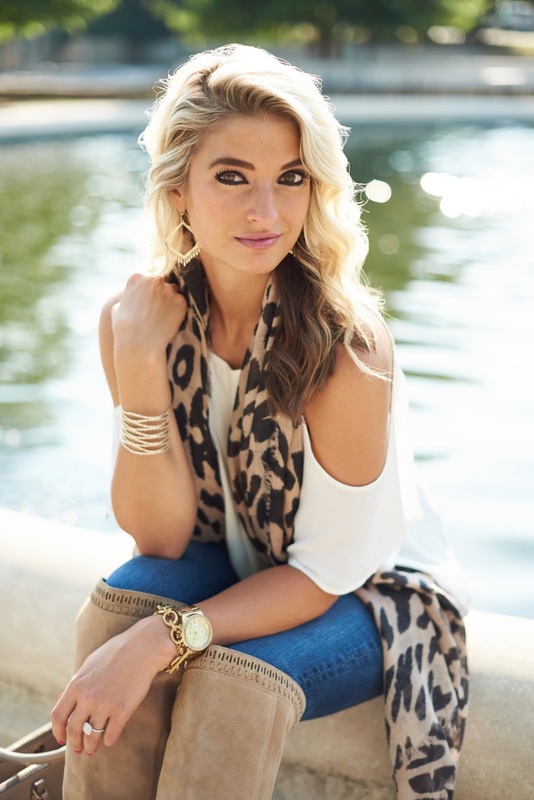 Summer is my favorite season, but all these fall pieces have me so excited for cooler temperatures and fall foliage! Hello, beautiful pictures. Anyway, I picked up this dress at the sale and it's safe to say it is 100% a winner. You guys have requested more work wear from me recently, so I thought it would be fun to show you how you can wear this piece to work, as well as to date night, a wedding, etc. If you're anything like me, you're always in a massive hurry before work in the mornings. I'm not a morning person, and I workout before work. So, I'm always rushing around my house to get ready and leave in time to make it to my corporate job! With that being said, I look for pieces that are easy to throw on and go, and dresses are just that. It's one piece that makes a whole outfit, add shoes and you're out the door! The only thing better than that, is the price tag of this dress right now. It's currently marked down under $100 (originally $150). Chelsea28 is one of my favorite brands at Nordstrom, they're pieces are high quality and last forever. I'm always willing to pay a little more for something that lasts a little longer. I love the on-trend ruffles around the shoulders of this one, and it has a little bit of stretch in it for comfort. If fits TTS, and I'm wearing a size 4. This outfit wouldn't be complete without mentioning my Tito Sandals, though! I also scooped these up at the Nordstrom Sale for $73, and they come in 3 colors. Suprisingly, they're super comfortable to walk in! If you're not looking for work wear, this is also the perfect dress for a wedding or date night! Instead of a work bag, add a clutch and a pair of statement earrings and voilà, you're ready for the evening! I had a busy weekend this weekend working on the blog, and styling all the pieces from the sale for you! Stay tuned for more blogposts/Instagrams throughout the week. Lots of great pieces! Shane was out of town at a wedding, and I'm happy he's finally back home again, it's so quiet when he's gone!